Almost everyone has seen a lichen (pronounced "like-in"), but few people know much about these small plantlike beings that have no roots, stems or leaves. On Saturday, April 22, 2017, Friends of Princeton Nursery Lands will hold its Arbor Day Celebration and Lichen Walk. 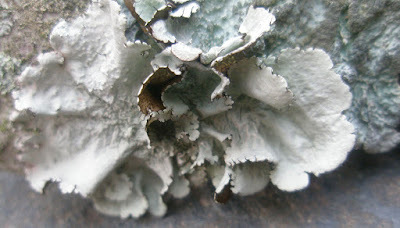 Dr. James Lendemer from the New York Botanical Gardens will lead a lichen walk in the Mapleton Preserve from 2 to 4 pm. He will identify and explain the importance of these unique and fascinating organisims—some of which are considered to be among the oldest living things. The walk begins at the D&R Canal State Park Headquarters, 145 Mapleton Road, Kingston. The event is free and all are welcome. For more information, visit the FPNL website or call 609-683-0483. Lichens are a fusion of two unrelated organisms, usually a green algae and a fungus, that grow slowly and can be especially susceptible to habitat disruption. Many species are sensitive to air pollution, and lichens are used throughout the world to assess and monitor air quality. An important part of the food chain, lichens are also used by various animals as nesting materials, dyes, and medicines, and serve as a food source for reindeer and caribou. Dr. Lendemer is a lichenologist at the New York Botanical Gardens. He currently serves as Assistant Curator of the Institute of Systemic Botany, which has the largest collection of lichens in the western hemisphere. His research on lichen biodiversity has been used to develop conservation management policy.